Goodrich castle stands pompously on a high rocky sandstone outcrop overlooking the River Wye. It commands the crossing of the river and, although in ruins, still demands respect. Its location is a mere 16 miles from Hereford and 4 miles from Ross-on-Wye, Herefordshire. The castle guards the line of the former Roman road from Gloucester to Caerleon as it crosses from England into Wales. The original wooden fortification is believed to have been built in 1101, by Godric of Mappestone (a local Anglo-Saxon thane and landowner), after the Norman invasion of England. However, Victorian historians believed the castle to date back further to the pre-Norman conquest days of King Canute. In the middle of the 12th century the original wooden construction was replaced with a stone keep. In the late 13th century it was expanded significantly into a concentric structure combining luxurious living quarters with extensive defences. The success of this design influenced many other constructions across England. At the heart of the castle is an early Norman square keep, with Norman windows and pilaster buttresses. The keep would originally have had an earth mound built up against the base of it to protect against attack. The Great Keep has the alternative name of the “Macbeth tower”, after stories of an Irish chieftain held prisoner there. A dominant feature in its architecture is the tower “spurs”, a solid square-based pyramid with circular towers rising up against the walls. This is very characteristic of castles in the Welsh Marches, and was designed to prevent attack. 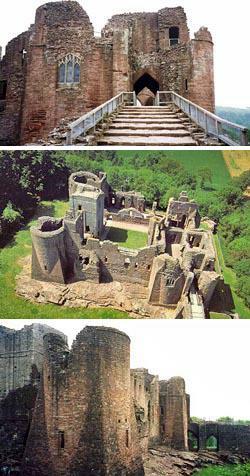 The three towers of the Goodrich castle were built during 1280s. The gatehouse’s east-facing tower contains the chapel, an unusual arrangement driven by a lack of space, and it’s said that the altar itself is particularly old, possibly pre-dating the castle. The bailey was designed to include a number of spacious domestic buildings. These include a great hall, a solarium, kitchen, buttery and pantry, with a luxuriously large number of gardrobes and fireplaces. The large towers provided additional accommodation too. Water for the castle was originally raised from the courtyard well (rumoured to be three times deeper than the height of the castle), but was later piped in from a spring across the valley; the castle kitchens had acquired running water by the beginning of the 17th century. The design of the buildings ensured that the servants and nobility were able to live separately from one another in the confined space of the castle, revolutionary at the time. Considered by historian Adrian Pettifer to be the “most splendid in the county, and one of the best examples of English military architecture”. At the end of the 18th century, however, Goodrich became a noted picturesque ruin and the subject of many paintings and poems; events at the castle provided the inspiration for Wordsworth’s famous 1798 poem ‘We are Seven’. By the 20th century the site was a well-known tourist attraction, now owned by English Heritage and open to the public. By the 1820s, visitors could purchase an early guidebook at the site outlining the castle’s history, and Victorian tourists recorded being charged sixpence to wander around the castle. The castle changed hands many times through the centuries and in 1920 its then owner, Mrs Edmund Bosanquet, granted the castle to the Commissioner of Works. The Commissioners began a programme of repairs to stabilise the ruin in its current state. Goodrich castle is truly overwhelming in its size and history. Considerable remnants still exist and the castle is open to the public. There are audio guided tours, facilities and a gift shop. Check their website for prices and opening times.